Rebel Quest is a day camp designed for 1st through 6th graders who want to keep their brain and body active during school breaks. Highly trained instructors and counselors lead and supervise students during Rebel Quest. The days are filled with hands on activities, reading enrichment, outdoor and indoor play, team building activities, and field trips on campus and within Oxford. Payroll Deduction – Price of day camp taken out over six (6) pay periods starting with the first payroll of July. Available until June 15th. Pay Now with Credit Card Discount – Pay now and get $25 off the day camp price. 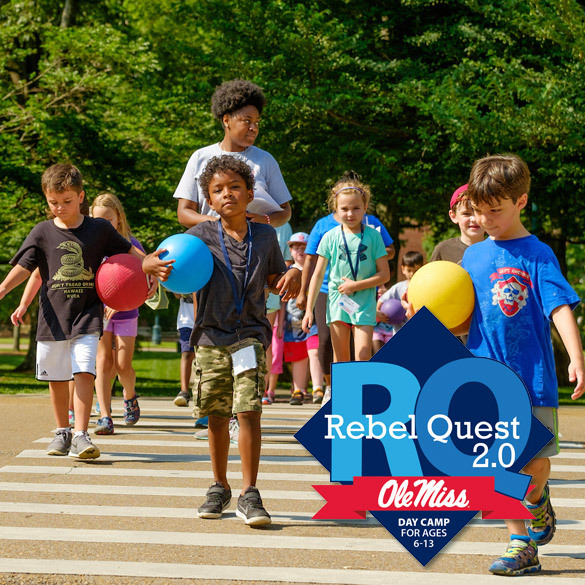 Summer Rebel Quest is a day camp held on the Ole Miss campus and led by highly qualified University and community instructors. Students will experience hands on learning and exploration that will encourage and motivate critical thinking. Students will explore different topics each week such as science, camping, arts, food from around the world, among other topics. Come with us on an adventure under the sea! We will explore the world of whales, sharks, seahorses, and other sea creatures all while learning how and where they live. This week will be a balance of science, reading, and art! All new experiments! Mad Scientist 2.0 is full of hands on science experiments for both new and returning Rebel Quest students. We will make water walk, grow crystals, create lava lamps, construct solar powered ovens, and much more! These experiments will engage us in science, technology, engineering, and mathematics. Gloves and goggles will be provided! Explore the pyramids of ancient Egypt, sail on the Mayflower with the pilgrims, compete in the first Olympic Games in Greece, and more! We will travel through time to learn about historical places, people, and events. We will participate in activities and games that will seem to transport us to different times and places. Discover how much fun we can have with exercise and healthy nutrition. We will make food pyramids, learn how water and nutrition help us grow, create simple and healthy recipes, engage in age appropriate exercises, and play games that engage our minds and bodies. How do astronauts sleep? What is a black hole? Can we live on Mars? What is on the other side of the moon? Join us as we answer these questions during our space week! We will visit the planetarium, view space through telescopes, discover how astronauts eat and sleep, and more! Come with us on an adventure through the biomes of the world! We will explore the tundra, rainforest, grasslands, and much more! We will study the animals and plants that live in each of these biomes and how they survive and thrive. We will explore the heroes of fantasy and fiction and meet every day heroes. Join us as we discover the heroes of fairytales and comics and meet firefighters, police officers, and other community helpers. We will learn what being a hero truly means, how to recognize the heroes around us, and how to find the hero inside of us. 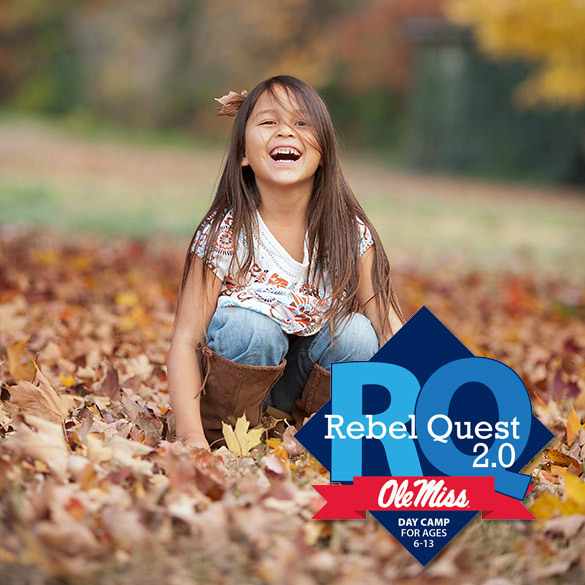 Fall Rebel Quest is a two day session held on Monday and Tuesday of Thanksgiving break on the Ole Miss campus and led by highly qualified University and community instructors. The days are filled with hands on activities, reading enrichment, outdoor and indoor play, and team building activities. Do you dare to become a mad scientist as we experiment in our science lab? This week is full of hands on science experiments, focusing on the STEM curriculum of science, technology, engineering, and mathematics. Gloves and goggles will be provided! Join us as we play games- indoors and out- and learn about the history of traditional games. We will be competing in board games, chess, checkers, dodge ball, double Dutch, four square, kickball, Lego competitions, and more! Calling all nature lovers! Join us as we explore all things camping. This week is for the outdoors lover, as we will participate in a survival course, hike Whirlpool Trails, go on a nature scavenger hunt, take on the Rebel Challenge Course, and watch a kayaking and canoe demonstration. We are off to explore Oxford on a guided tour, a walk through Faulkner Woods, a visit to Rowan Oak, and a scavenger hunt on the Ole Miss campus. The fun does not stop there! We will also tour the Ole Miss Indoor Practice Facility and the Ole Miss Pavilion. We will travel to the seven continents this week as we learn about different traditions and customs around the world. Try out a new language, foreign foods, cultural art projects, and visit with guest speakers as we take virtual field trips. Calling all foodies! It is okay to play with your food this week. Get ready to join in on the food fun as we create new recipes, get our hands dirty with food science experiments, and sample different cuisine. Future artists are welcome as we paint, sculpt, and craft new creations this week. We will focus on different mediums of art and visit with local artists to learn about their craft. We will be outside and active as much as possible, so your child should wear athletic shoes (which do not include Crocs) and comfortable, casual outfits that are appropriate for outdoor play. Girls should avoid wearing dresses, if possible, and everyone needs sunscreen! Where will my child be all day? Students will be in Lamar Hall, the Grove, and visiting other locations on campus. Children will be going to the Grove each day for outdoor activities, as well as to different athletic facilities in and around the Turner Center. At the beginning of each week, the instructors will post an agenda and where the students will be on certain days. Also, parents will be given the lead instructor's cell phone number in the event of an emergency. The instructors for Rebel Quest are all certified teachers and have designed a curriculum to entertain and educate your child. Because our instructors have specialized interests, each day of camp will be dynamic and new. Students will be learning something new and have tons of fun doing it. We will be moving all day long; they will not be bored! 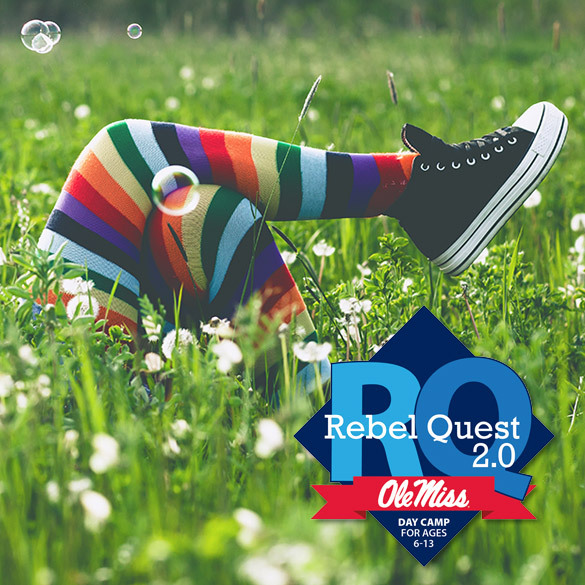 Students will have two Rebel Quest counselors, one of each gender, with the group at all times, plus the Lead instructor of each given session. All of our staff is CPR/First Aid certified, have submitted to background checks, and have completed the UM Supervision of Minors training. In the event of an emergency, counselors and instructors will first attempt to contact the parents, and if they are unavailable, the emergency contact person will be called, as well as any emergency personnel if needed.